The Chinese curse, “May you live in interesting times,” is particularly apt in light of the progress scientists are making now in mapping and sequencing the human genome. For their progress carries with it portentous issues and ethical dilemmas, here addressed by Wingerson. 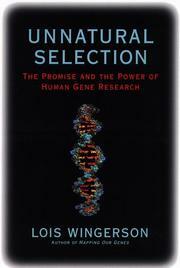 She begins with absorbing accounts of some of the first single-gene-defect diseases to be discovered—Tay-Sachs and sickle-cell anemia—as examples of how to handle genetic information well (as Jewish groups did in the case of Tay-Sachs) and badly (as did the Air Force and others in the case of sickle-cell disease). These and other examples illustrate the many issues the author raises concerning the roles of the public, religious leaders, policymakers, commercial laboratories, obstetricians, genetic counselors, et al., as purveyors and users of genetic information. Then Wingerson (Mapping Our Genes, 1990) steps back, in almost a book-within-a-book fashion, to offer a history of the eugenics movement and sterilization laws from the turn of the century through the Nazi era, including telling profiles of the key players. Assisted by all of this stage-setting, the reader is well prepared to grapple with (and evaluate) the “promise and power” of human gene research, including the potential for “cherry-picking” only healthy clients under managed health care, prenatal testing for frivolous reasons, and the implications of behavioral-genetics studies indicating the existence of genes that are predisposed to violence or alcoholism. Intense debate is underway on such issues, with a spate of laws passed and bills proposed (enforceable or not) that can dizzy even the coolest head. In fact, it would be easy for the author to leave her reader lost in confusion or despair. But instead, Wingerson manages to conclude on an upbeat note: Human genome knowledge reveals the complexity of evolution, she affirms, since we are what we are due mainly to the interactions of multiple genes in our given environment. Few could be more knowledgeable than she is in guiding us through such hot topics.